The National Organization for Vehicle Accessibility (NOVA) believes that every individual has the right to accessible transportation. 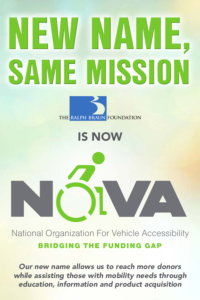 NOVA’s mission is to assist those with mobility needs through education, information and product acquisition. Please visit the Grant Program page for more information regarding our Mobility Assistance Grant Program. Proudly supporting ALL National Mobility Equipment Dealers Association (NMEDA) manufacturer mobility products sold by certified NMEDA mobility dealers! NOVA is a 501(c)3 public charity.